The stock market reacted negatively when the yield on the 10-year U.S. Government bond reached 3%. There was a major one-day sell-off the first time that benchmark was reached. Here’s what Brian Wesbury, Chief Economist at First Trust has to say. Just a few weeks ago, the Pouting Pundits of Pessimism were freaked out over the potential for the yield curve to invert. They’ve now completely reversed course and are freaked out over a 3% 10-year Treasury note yield. These fears are overblown. Faster growth and inflation are pushing long-term yields up – a good sign. And, yes, the Fed is normalizing its extraordinarily easy monetary policy, but that policy never distorted markets as much as many people suspect. Quantitative Easing created excess reserves in the banking system but never caused a true acceleration in the money supply. That’s why hyper-inflation never happened and both real GDP and inflation remained subdued. Profits, not QE, lifted stocks. And our models show that low interest rates were never priced into equity values, either. We measure the fair value of equities by using a capitalized profits model. Simply put, we divide economy-wide corporate profits by the 10-year Treasury yield and compare these “capitalized profits” to stock prices over time. In other words, we compare profits, interest rates, and equity values and determine fair value given historical relationships. The lower the 10-year yield, the higher the model pushes the fair value of stocks. Because the Fed held short-term rates so low, and gave forward guidance that they would stay low, they pulled long-term rates down, too. As a result, over the past nine years, artificially low 10-year yields have caused our model to show that stocks were, on average, 55% undervalued. In other words, stocks never priced in artificially low interest rates. If they had, stock prices would have been significantly higher, and in danger of falling when interest rates went up. But we have consistently adjusted our model by using a 3.5% 10-year yield. Using that yield today, along with profits from the fourth quarter, we show the stock market 15% undervalued. In other words, we’ve anticipated yields rising and still believe stocks are undervalued. A 3% 10-year yield does not change our belief that stocks can rise further this year, especially with our expectation that profits will rise by 15-20% in 2018. The yield curve will not invert until the Fed becomes too tight and that won’t happen until the funds rate is above the growth rate of nominal GDP growth. Stay bullish. Bill Miller beat the S&P 500 index 15 years in a row as portfolio manager of Legg Mason Capital Management Value Trust (1991-2005), a record for diversified mutual fund managers. He was interviewed by WealthManagement.com about active vs. passive management. We have written a number of articles about the mistakes individual investors make. But what about mistakes that financial advisors make? We are, after all, fallible and make errors of judgment. And like all mortals we cannot predict the future. One problem is how they deal with risk. There is a lot more action on perceived risks, exposing clients to risks they aren’t aware of. For example, since the financial crisis people have overweighted bonds and underweighted stocks. People react to market prices rather than understanding that’s a bad thing to do. Most importantly, most advisors are too short-term oriented, because their clients are too short-term oriented. There’s a focus on market timing, and all of that is mostly useless. The equity market is all about time, not timing. It’s about staying at the table. Think of the equity market like a casino, except you own it: You’re the house. You get an 8-9 percent annual return. Casinos operate on a lower margin than that and make money. Bad periods are to be expected. If anything, that’s when you want more tables. We agree. That’s one of the reasons we are choosy about the clients we accept. One of the foremost regrets we have is taking on clients who hired us for the wrong reasons. One substantial client came to us as the tech market was heating up in the late 1990s. He asked us to create a portfolio of tech stocks so that he could participate in the growth of that sector. We accepted that challenge, but it was a mistake. When the tech bubble burst and his portfolio went down and we lost a client. But it taught us a valuable lesson: say no to clients who focus strictly on short-term portfolio performance. Our role is to invest our clients’ serious money for long term goals. Like Bill Miller, we want to have the odds on our side. We want to be the “house,” not the gambler. The first rule of making money is not to lose it. The second rule is to always observe the first rule. To determine client and portfolio risk we use sophisticated analytical programs for insight into prospective clients actual risk tolerance. That allows us to match our portfolios to a client’s individual risk tolerance. In times of market exuberance we remind our clients that trees don’t grow to the sky. And in times of market declines we encourage our clients to stay the course, knowing that time in the market is more important than timing the market. Because retirees are no longer earning income, they view a decline in their investments with more concern than those who are still working. Many savers in retirement also focus on a number that represents the peak value of their portfolio and view any decline from that value with concern. The unfortunate result of this is that it causes them to worry, leading to bad decisions. This includes selling some – or all – of their stock portfolio and raising cash. This makes it more difficult for their portfolios to regain its previous values, especially when the return on cash-equivalents like money market funds and CDs are at historic lows. The answer to this dilemma is to create a well-balanced investment portfolio that can take advantage of growing markets and cushions the blow of declining markets. This is often where an experienced financial advisor (RIA) can help. One who can create diversified portfolios and who can encourage the investor to stick with the plan in both up and down markets. What the tortoise knows about financial security. Remember the race between the tortoise and the hare? The tortoise won because he kept plugging along while the hare took a nap. Everyone would like to get rich quick; it’s the reason that people buy lottery tickets. But the chances of actually striking it rich are astronomical. The way to get financially well-off is within the reach of almost anyone, even people who start out poor. What it takes is following a few simple rules. Get an education and acquire a skill. The temptation to parlay a small bundle of cash into a fortune is what gets most people into trouble. Consistent saving over time is much more likely to pay off than strategies such as timing the market. Risk-the-farm investing strategies have a high probability of failure, but saving and prudent investing always wins. Getting rich slowly is the primary way that most people achieve their financial dreams. The advantage of saving 10% or more of your income cannot be overemphasized. Do that and then let compounding go to work for you. Compounding does a lot of the heavy lifting for investors. But it needs time to work. That means starting the process as early as possible and staying with it as long as possible. Waiting until you’re in your 40s or 50s means that you have given up twenty to thirty years of financial growth that you will never get back. Want to have a million dollars by the time you’re 65? If you begin when you’re 25 with $25,000, save $3000 a year and invest the money to get a 7% return you’ll have $1 million when you’re 65. Of course as you get older and make more money you’ll be able to increase your savings rate, and end up with more than a million. Finally, control your emotions or – better yet – hire an investment manager who will help control your emotions for you. Markets don’t go in one direction forever and that’s a good thing to keep in mind when the inevitable correction happens. An investment portfolio that lets you sleep well at night helps to cushion the blow of a decline and avoid the temptation to “bail out” at exactly the wrong time. In fact, investing more when the market’s “on sale” is a way to increase your wealth. This is New Year‘s Eve; 2016 starts at midnight. It’s a great time to start if you have not done so already. This person had about 80% of their account in stock funds up until Friday, August 21st. On that day the decline got to him and he sold all the stock funds. It turns out that this person sold out of stocks within two trading days of the market bottom. By the time they came to see us, their account was mostly in bonds. 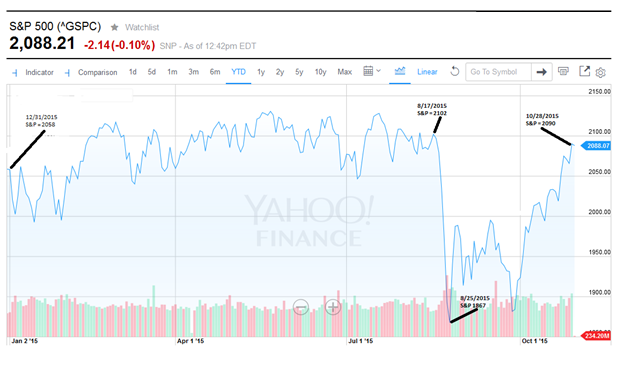 Referring again to the chart, notice that as of October 28th the market actually had a positive return year to date. By trying to time the market, this investor locked in a loss and was wondering what to do now. This investor made two mistakes. First, they thought they could time that market and get out when things were bad and buy back in when things were better. Timing the market is a term that is used when people buy or sell based on market gyrations, often trying to get in when they think it’s at a low point and get out when they think it’s at a high point. Some people get lucky and may do it once or twice but it’s simply not possible to do this consistently. The second mistake was that they had created portfolios that were out of line with their personal risk tolerance – they started out much too heavily in stocks and then swung too far in a conservative direction when the stock market went down and is now too heavily invested in bonds. Most people will look at the value of their investments only occasionally. Some will do it daily; it is like a game to them. It’s also counter-productive. The secret to long-term investing success is to create a portfolio that is properly aligned with your personal risk tolerance and financial goals, so that you don’t have to get concerned with every market move. .
Not every stock market recovery is as V-shaped as the one illustrated in this chart. However, it’s a great illustration of the opportunities that are missed by trying to guess short term market moves. We believe in prudent investing for the long term and design portfolios that reflect the risk tolerance of our clients. If you are interested in a free consultation of your portfolio, contact us. Trying to time the market – thinking you can get out before a market decline and get back in when the market is down. It never seems to work. Chasing hot investments – from chasing internet stocks in the 1990s to real estate ten years later often leads to financial disaster. Abandoning investment plans – if you have a strategy, and it’s sound, stick with it for the long term. Avoiding out-of-favor areas – for some reason, people want bargains in the store but avoid them in the market. Don’t be part of the herd. Few amateur investors have the training or discipline that allows them to avoid these costly mistakes. One of the most important services that a trusted investment manager can provide is to remain disciplined, stick with the plan, remember the goal and focus on the long term. For more information about professional investment management visit Korving & Co.
Korving & Co. is a fee-only Registered Investment Advisor (RIA) offering unbiased investment advice. Arie and Stephen Korving are CERTIFIED FINANCIAL PLANNER™ professionals.